Antique, art, design and vintage collectibles has always been my passion and a big driving force in my life. I´am art dealer and interior stylist. and designs to promote Niels-peder tailor shop. The Rydeng legacy: A modern art collection. The art-loving tailor, Niels-Peder Rydeng, had by the 1920ties, one of the largest modern art collections ever seen in Scandinavia. Niels-Peder Rydeng was not a wealthy man, and most of his life he could only acquire art through untraditional methods. One of his methods was swabbing and he often invited young artists to take a piece from his collection in exchange for one of their artworks. Another successful method were offering the young artists a collection of tailor-made suits in exchange for some of their artworks. Among the many visitors in his house were modern artists like; Edvard, Munch, Olouf höst, Edvard weie, J.F Willumsen, Sigurd Swane, Borge L. Knudsen, Folmer Bonnén and Karl Isakson. In 1925 the modern collection filled Rydeng entire house and tailor shop. It was more a museum than a house and Niels-Peder Rydeng began looking for houses where he could open a museum. In 1930 Niels-Peder Rydeng offered to donate his entire collection to the city of Ellsinore in exchange for providing him a building for his works. The city sadly declined his offer and in 1935, Niels-peder begun selling from his collection to the auction house “ Winkel og Magnussen. 253 works of art was sold in 1935. 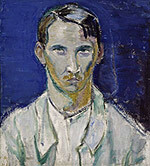 Among them were 43 works by Edward Munch and many other works by artists like; Harald Giersing, Jais Nielsen, Theodor Philipsen, Olaf Rude, William Scharff, Frits Syberg, Edvard Weie and Ernst Zeuthen. The auction house Winkel og Magnussen published a special catalog for the sale of the Collection and wrote the following passage: “ The N.P Rydeng collection is the result of 25 years of true respect and adornment of art. A man with very restricted resources but with a boundless love of the arts. The Rydeng auction catalog 1935. Niels - Peder Rydeng died in 1949, 14 years after the famous auction sale. At his death he left more than 200 important modern works. The many paintings were diverted into smaller groups and given to his 12 children and to friends of the family. Translation and photos by my sister Josephine Rydeng, the maintainer of all obro-artgallery`s eBay auctions here She is also a great collector of fine Scandinavian modernism.